Authentic Progressive Rock Loops From a Legend! Bill Bruford Stereo Grooves Volume 2 is part of the Drum Masters series where you can pick out a la carte kits and grooves that work with Sonic Reality’s Infinite Player plugin and build one of the most powerful virtual drum collections ever! This product is a collection of stereo grooves made to be played from Sonic Reality's Infinite Player. 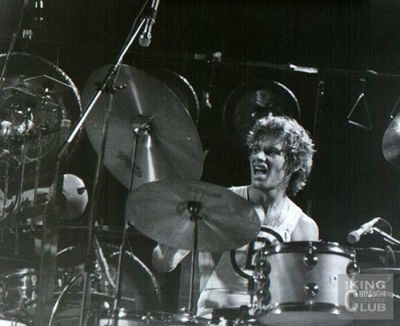 The grooves were played by Bill Bruford on his famous half-electric/half-acoustic setup made famous by his inventive playing with progressive rock innovators King Crimson. This collection reflects Bruford's renowned physical intricacy and use of odd time signatures, as well as the unique combination of cymbals, log drums, acoustic drums, and electric pads that is particular to Bill Bruford's style. Bill Bruford is a drummer known for innovative playing with classic rock and jazz groups such as Yes, King Crimson, UK, Genesis, Patrick Moraz, Al Di Meola, Chick Corea, ABWH and many others. Specializing in odd time signatures and a distinct high pitched snare, big roto toms and pioneering the use of percussion electronics, Bill’s sound has always been recognizable as his own. Bill Bruford collaborated with Julian Colbek and Keyfax to create a Bill Bruford 3 Pack sample library featuring grooves and drum kits played by Bill in the studio. It was briefly distributed by Qup Arts and then became rare and hard to find. Sonic Reality contacted Julian and Bill to see if we could update it to the latest loop and sampler formats and include it as part of the Studio ProFiles Stereo Master series. 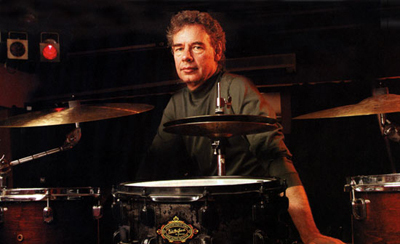 Quote from Dave Kerzner of Sonic Reality about Bill Bruford: "There were several rare drum libraries recorded with famous drummers in the late 90s. 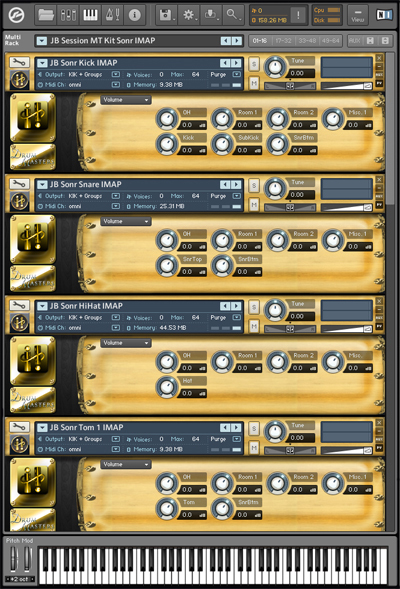 I actually wanted to have them in modern loop formats like Rex2 myself so I could use them in my music. I figured that if I did then surely a lot of other people would too! So, I was on a mission to find Bill Bruford and ask him if he’d like to join our list of top drummers in the Studio ProFile series. We’re very happy that he did and now his classic drum grooves are available for the Infinite Player!" Drum Masters Stereo Drum Grooves offer natural acoustic drum loops in a variety of styles played by some of the best drummers in the world! Conveniently mixed stereo audio Rex format grooves can be played from the keyboard and combined with the midi-playable multi-track or stereo drum kit all from the same session to create the a drum track with incredible reaslism and expression. • Rex Loops Mapped to the Keyboard: Stereo Rex grooves are conveniently mapped and playable from the keyboard for the ultimate real-time performance and speed of composition. With Drum Masters Stereo Grooves you even have access to the Rex files to use with other Rex compatible software such as DAWS and Samplers! • Loops Can Automatically Sync to Your Host's Tempo! Drum Masters Stereo Grooves are set to automatically sync to your host's tempo. This can be turned on or off in the plug-in for the ultimate convenience and flexibility in your work flow. • Authentic Played Audio Grooves Add Realism! By combining the audio grooves with your midi kit performances you get more nuances, feel and interaction of the kit which helps to simulate a REAL multi-track drum session. • Ideal Material to Use with Effect Plug-ins: Flexibility to process the natural acoustic drum sound through your favorite studio effects plug-ins and channel strip EQ in your DAW. • Uses the Infinite Player Software: All Drum Masters Kits and Grooves are played from Sonic Reality’s Infinite Player virtual instrument software powered by Kontakt™ which works stand alone for the Mac and PC and as a plug-in for major DAWS like ProTools, Cubase, Logic, Sonar, Digital Performer and more.